Scoot Airlines has launched its inaugural Singapore – Kuching flight on October 29 this year, arriving at Kuching International Airport at 9.55pm. The new daily flights departing Singapore at 8.30pm on Sunday to Thursday, 6.10pm on Friday and 6.10am on Saturday. The return flights from Kuching depart at 8.35pm on Sunday to Thursday, 8.15pm on Friday and 8.15am on Saturday. “We are confident that the launch of Scoot’s direct flight between Kuching and Singapore will further help us to promote Sarawak and Kuching as the preferred nature tourism destination,” said the Minister of Tourism, Arts, Culture, Youth and Sports, Datuk Haji Abdul Karim Rahman Hamzah. 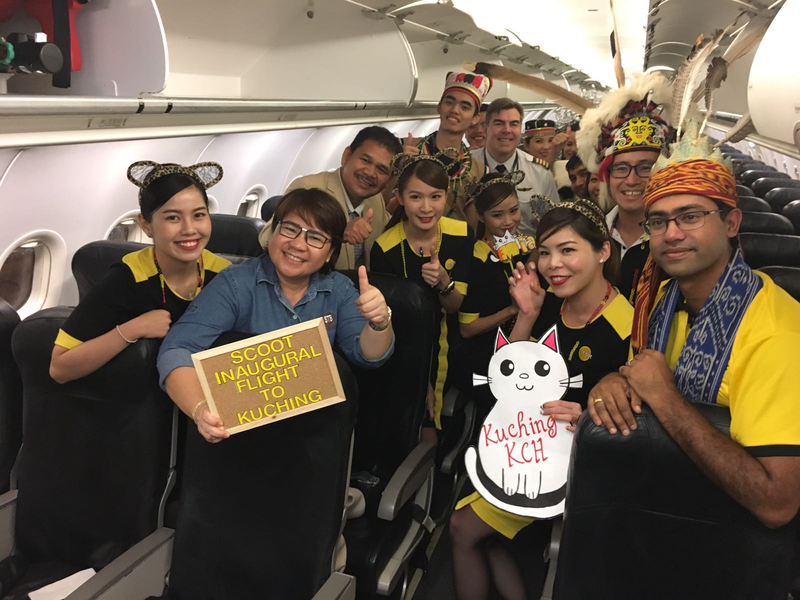 Cultural troupe on the inaugural Scoot flight with Acting CEO if STB Mary Wan Mering (Second from left), Permanent Secretary of Ministry of Tourism Arts and Culture Datu Ik Pahon (Third from left) and Chief Commercial Officer of Scoot Vinod Kannan (first from right).